Two women and a child were taken to hospital following a serious crash in Peterborough last night, Thursday May 5. Police, fire and ambulance crews were called to the scene of a serious collision in Goldhay Way at 6.11pm. A car and a van were involved in the crash, one of which hit a tree. Fire crews had to cut one person free of the vehicle. The East of England Ambulance Service sent three ambulances, a rapid response vehicle, and an ambulance officer to assist. 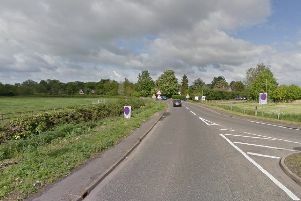 At the scene three patients were treated – a woman believed to be in her 40s who had suffered a hand and leg injury, a woman believed to be in her 20s who was treated for a head injury, and a boy, who had unconfirmed injuries at that time. All three were taken to Peterborough City Hospital for further care.